Another decimal time app for iOS iPhone. Salut et Fraternité (opens iTunes) is very similar to Calendrier, as it shows the Republican calendar date and decimal time below art from the French Revolution, namely a famous depiction of the Declaration of the Rights of Man and of the Citizen. It also allows conversion both to and from Republican calendar dates, while Calendrier only converts from Gregorian to Republican. It also displays the decimal time on a simulated antique watch with animated hands. Although similar to Calendrier, Brumaire has offered versions of their Salut et Fraternité software for years. Like the other versions, the app calculates dates by inserting a leap day before every year divisible by four (except century years). This makes it continuous with historical dates from the First Republic, when each year started on the autumnal equinox, resulting in leap days at the end of years 3, 7 and 11. Calendrier gives two different options, either to have current years begin on the equinox, or Romme's proposal to insert a leap day at the end of every year divisible by four, although the implementation of this is buggy. It just happens that dates for this year (ER 218) are the same for all three methods. Octidi 8 Messidor an CCXVIII à 4hd 94md t.m.P. Update: (55441.294, Sextidi 16 Fructidor an CCXVIII à 3hd t.m.P.) Version 1.1 has dropped in the App Store, featuring calendar girl images for each month from the Revolution, optional seasonal images on the Convert and Genealogy tabs, and an option for Arabic instead of Roman numerals. Also, swiping on the settings tab brings up bios for calendar creators Gilbert Romme and Fabre d'Eglantine and a gallery of calendar girls, with text of the associated poems in French. Complementary days, which are in a couple of weeks/décades, still show the Declaration of the Rights of Man and of the Citizen. There's a new catchall term for what has heretofore been called the iPhone OS, which is also used on the iPod Touch and iPad: iOS. So from now on I will call these simply iOS devices. This comes with the announcement of the new iPhone 4, which will run iOS 4.0. I might get the iPhone 4, since my wife has been bugging me for one, so she'll either get my old phone or we might even share an iPad. The flash and sharper display are nice (especially when the Netflix app is released) as would be the front-facing camera if I had anybody to use it with who also has an iPhone 4, but the iPad's large display would be a lot better to use at home, even though it costs at least $300 more. Either way, I look forward to using iOS 4.0 on my current iPhone 3GS when it becomes available on July 21 (55351). It has a couple of useful features, including multitasking and folders. I really need these, and had to "jailbreak" my iPhone to get them before. However, there are other things I'll probably still need to jailbreak my iPhone for, such as listening to podcasts through my mono Bluetooth. Of course, there are some other great phones available now, but I've become accustomed to my iPhone, and so far as I know there aren't very many decimal time apps, although I have heard that there is one for Android. I'm not an Apple fanboy, and I've never had bought an Apple product before my current iPhone, but I do love the iOS platform. 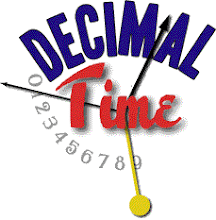 Yet another decimal time app has appeared in the iTunes app store, dTime by Cyberlab, (opens iTunes) currently for free. This one displays a simple analog clock dial with 100 marks around the edge, with the corresponding digital time displayed below. The digital time is divided into three fields, each field having two digits. The first unit is called "kar" (I don't know why) which is equal to one centiday or 14.4 minutes. The next unit is called "mnit" and is equal to 100 microdays or 8.64 seconds. The third unit is unnamed and is equal to one microday or 86.4 milliseconds. The analog dial has three hands. The "kar" hand makes a complete rotation once per day, just like a French revolutionary clock, but it points straight down at midnight (00) represented by a black circle, and straight up at midday (50) represented by a white circle. The "mnit" hand makes one rotation every "kar", which makes it ten times faster than the minute hand of a revolutionary clock, and again points down for 00 and up for 50. Then there is a little hand offset from the others, which makes a rotation once every "mnit", although this hand points up when the units are 00 and down for 50. The Cyberlab web site has a Belgian domain and is in French, which is ironic since the authors seem unaware of French decimal time, and have reinvented the wheel. C'est la vie!